3.5mm headphone plug, built-in microphone. A standard Q8 format, A13 based tablet, but with separate UART pads. The PCB is clearly marked HSG_H702_V1.2. 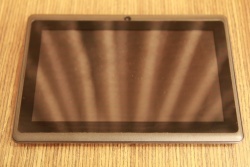 The android strings are not helpful as both are generic A13 Allwinner strings. The only option to properly identify this device is by opening up the case and reading the markings on the board. For building u-boot, use the "A13_MID" target. Use the sun5i-a13-hsg-h702.dts device-tree file for the mainline kernel. On the front of the mainboard, there are two test pads next to the SoC. Solder on some wires according to our UART howto. 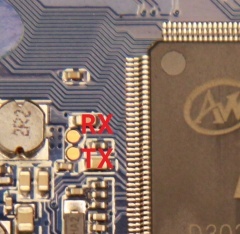 These pads are connected to UART1, and are not multiplexed with the SD card. This page was last modified on 20 January 2015, at 16:35.